Also around that time, California was establishing itself as a major supplier of hops for the brewing industry, and prior to the destruction of prohibition, Sonoma County was a major hops supplier. While now know better as a wine region, this county is still an important player in the beer ingredient chain. Beer ingredients isn’t the only thing California is known for, it also holds claim to another beer history first. During the booming years of the early 1850s, lager beer was also sweeping across the country. In areas like St. Louis, and Wisconsin, brewers leveraged the geographical features (caves) of those areas to assist with the lagering process. However California does not have access to the caves that are under St. Louis, and with the advent of refrigeration for beer production still a few years away, California brewers had to make some adjustments. Using the bottom fermenting lager yeast, but allowing fermentation to occur at temperatures more common for ales, a new style of beer was born: Steam beer. These days, steam beer is associated with Anchor Brewing (due to trademark,) but there are others out there, brewed under the category of California common beer. This week, we didn’t have any common beer in our tasting selection, but we did have a nice (very small) variety of beer from the state. Many of them very interesting. 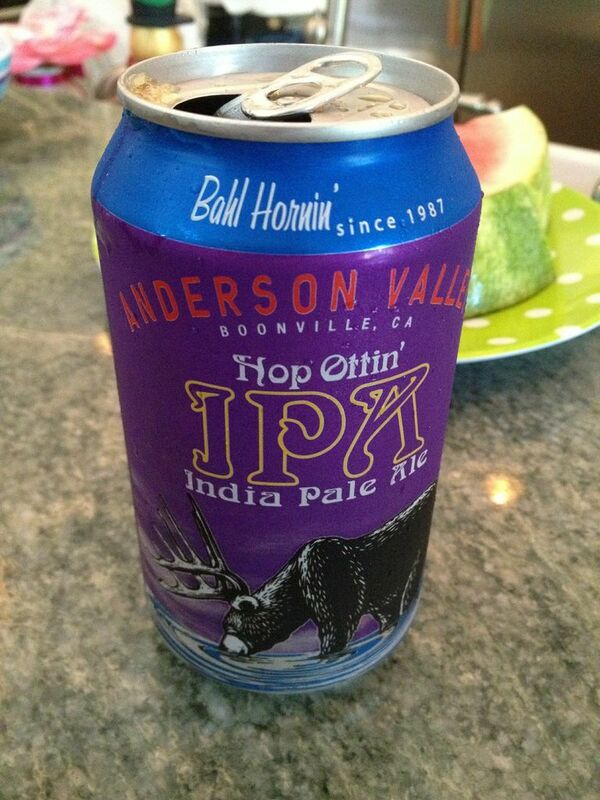 We started the week off with an Hop Ottin’ IPA from Anderson Valley Brewing Company. This beer we drank straight from the can, and it was good. The day was hot, not too hot, but hot enough to really enjoy an IPA, and this one did the trick. It had a really nice hoppy flavor and finished slightly bitter, but the bitter quickly went away, leaving no bitter aftertaste. I would buy this beer again. 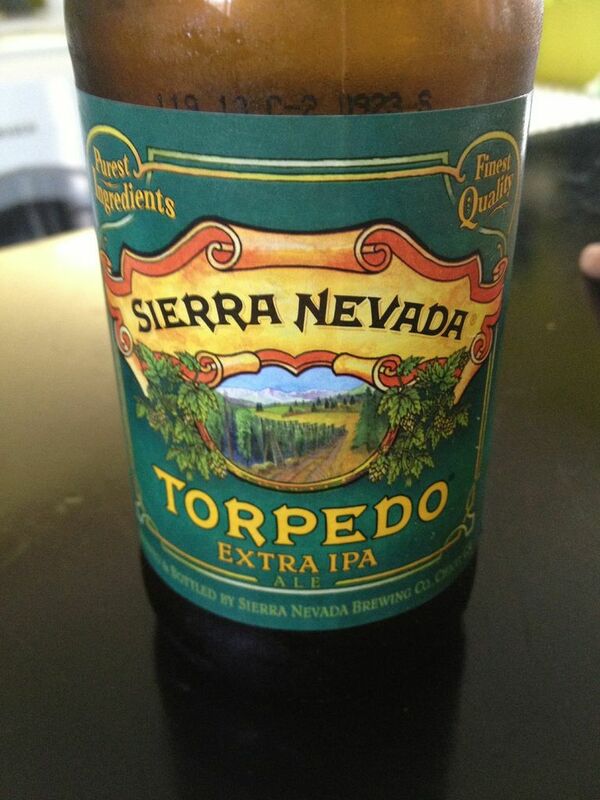 Keeping the week rolling, a few days later, we opened a Sierra Nevada Torpedo Extra IPA. This beer had a piney aroma when opened, and it was stronger hopped than their more popular Pale Ale. This was my first time drinking this beer, and I liked it. It was well received across the tasting party, and our special guest Pete gave it two thumbs up. I wouldn’t be surprised if he buys it again. Moving on from the Torpedo, we ventured into more extreme waters. Much like the wide ranging state they represent, the California beers of the day covered a variety of styles and flavors. We brewed this ale with around 40% rye as a base malt and let our sour yeast and bacteria eat away at it in oak barrels for over a year creating a sour ale with a complex character of rye spice, oak and a subtle funk. and quickly got the response of: “Not sure the funk is all that subtle!” We also tried this beer with some spicy food, and found it really changed the flavor of the beer, but for me, it also damped down the interesting flavors and wasn’t as enjoyable. This brewery is going on my watch list. I must try more of their stuff. I think I agree, and we are about to add another to the different category. 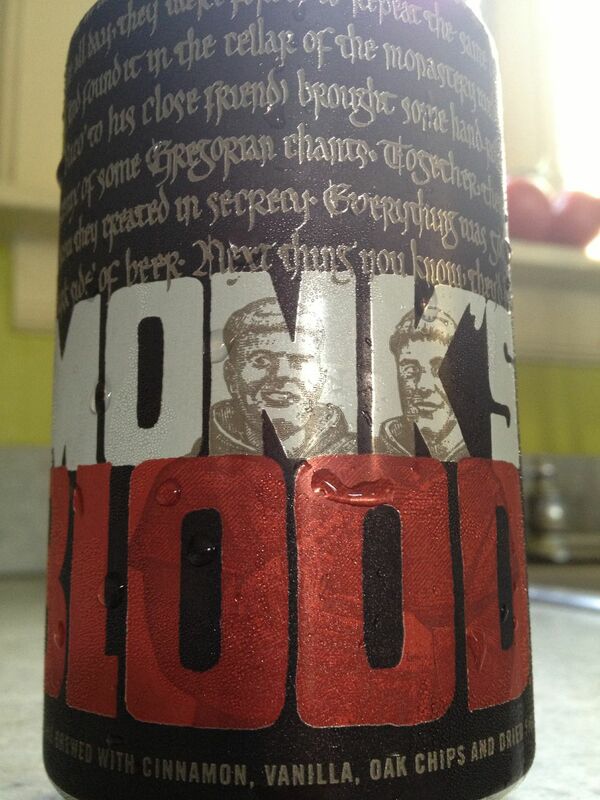 Following the Sour in the Rye, we opened a beer from 21st Amendment called Monks Blood (no link on the brewers site). 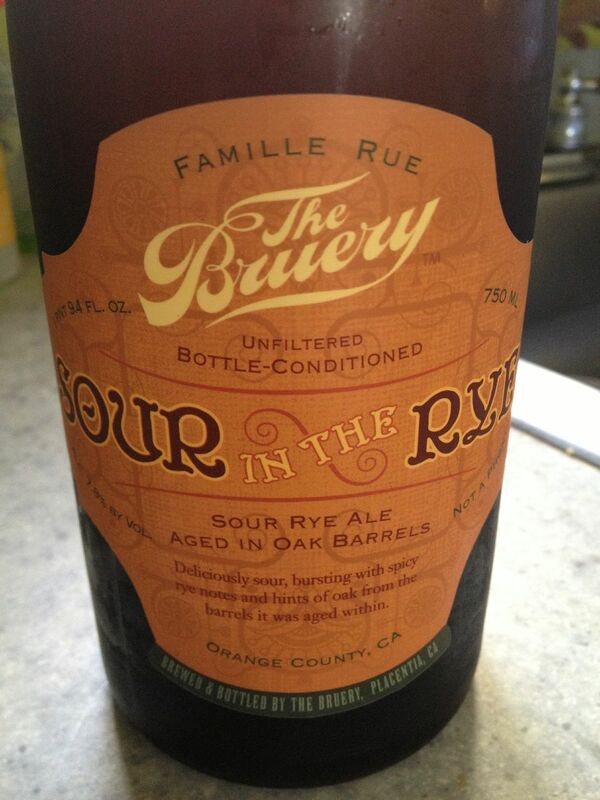 This beer, brewed with figs, oak chips, vanilla and cinnamon, was the most unique of the night. I really enjoyed this beer, but I was alone in that group. This is not a beer you are going to sit and drink 2 or 3 of. With its thick mouthfeel and sweet smell, this is something you sip over a duration. Others felt it was a dessert beer, and I could see that. The fig taste was subtle, and the tail end of the taste. Unique and full of character. 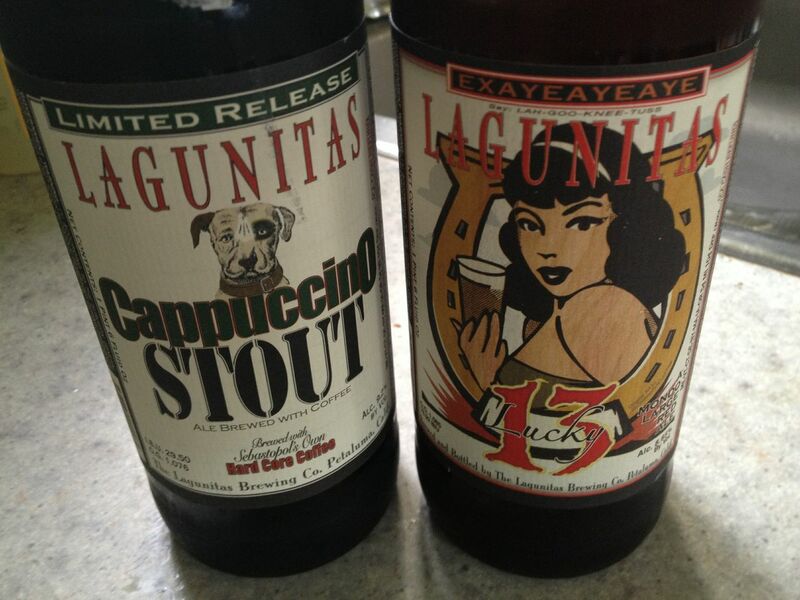 Keeping the day rolling, we opened a Lagunitas Lucky 13 and a Cappuccino Stout. The Lucky 13 had a strong piney smell as Joel described “Beat over the head with the pine.” This was true. I enjoyed the pine at first, but after a few sips, the pine overpowered everything else and took over the beer. The Cappuccino Stout was a nice, well rounded stout. It had a distinct chocolate smell and a wonderful coffee taste. Another great coffee beer. Later in the week, I discovered a Stone RuinTen in my stock. That was a nice surprise, for a mid-week beer. That wraps up a (late) California post. Next week, Minnesota.